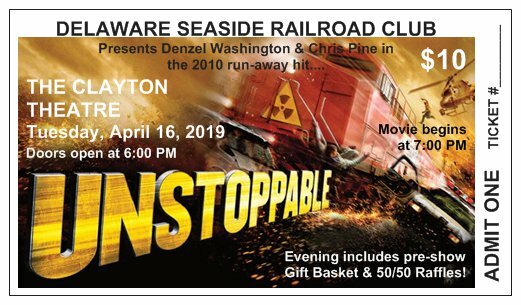 On Tuesday, April 16 at 7 p.m., the Delaware Seaside Railroad Club in conjunction with the Clayton Theater, will host the movie “Unstoppable”, starring Denzel Washington and Chris Pine. Doors open at 6 p.m. with opportunities to purchase 50/50 tickets along with a Gift Basket raffle. Between 4 and 6 p.m., Porto’s will be supporting the event by contributing to the Delaware Seaside Railroad Club a percentage of meals purchased at that period of time. Porto’s provides great food and a reasonable price. It is the favorite of the club’s members.